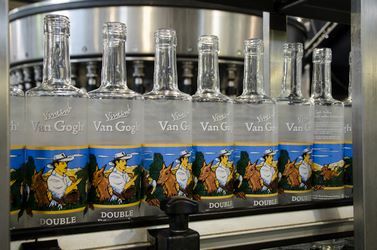 Hand-crafted with the finest ingredients in Holland, Van Gogh Vodka is unquestionably the leader in vibrantly flavored, authentic vodkas. Each sip will transport you to an orchard, the tropics, a chocolate shop or your favorite coffee house. It is a feast for the senses. Alexandrow Vodka is a 100% crystal clear vodka produced through a special process. The taste is mellow, pure and smooth. Alexandrow vodka is also available as a 37,5% drink and as a kosher vodka. Dworek Vodka is a clear and pure vodka, produced from the finest grain. It is popular all over Europe, because of its mild yet distinctive taste. It is a favourite drink among Scandinavians. Dworek Vodka Black Label is a premium and pure Polish vodka. It has a mild yet distinctive taste which is acquired by a five-fold distillation of the finest grain, with the smooth taste of Spelt grain. Crystal clear water is used for this unique recipe. Pjotter – the fun tasting experience. Pjotter Vodka is a smooth premium quality vodka, which is best enjoyed straight on the rocks. Pjotter Red Citrus is a combination of sweet oranges, grapefruit and crystal clear vodka. Pjotter Violet Black Fruit is a crystal clear vodka combined with the bittersweet taste of black berries and the sweetness of cassis.